On the heels of of the creepy yet awesome Steve Jobs Carbonite iPhone case comes the Dokkira Hand iPhone 4 Case from Strapya World. 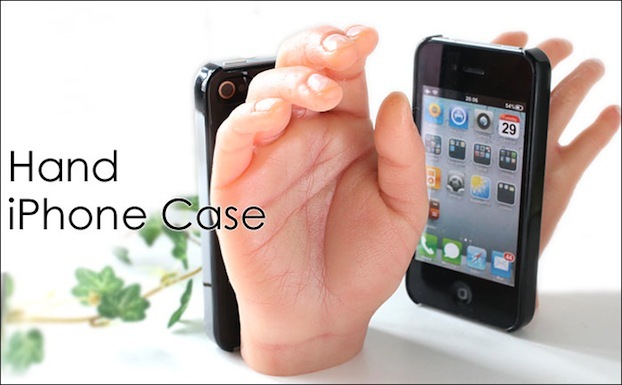 As if a silicone and vinyl hand as an iPhone 4 case wasn’t creepy enough this case comes in two versions: Lady’s Hand, made from the COO’s wife’s hand and, uh, Kid’s Hand. The company mentions not to ask them any questions about the Kid’s Hand version and trust us – we don’t want to know. Even though we can see the camera poking out from behind the pinky finger the fine print says to remove your iPhone from the case before taking pictures, go figure. We have to give Strapya a hand (HA HA) this is one awesome, unusual, and creepy case. The Dokkira Hand iPhone 4 Case could only be more awesome if it integrated the USB Human Thumb Drive we posted about back in 2005. As an added bonus, according to the product description every hand will vary in size and shape as each is unique and individually made. If you’ve got $64.20 burning a hole in your pocket and the desire for hand to hold while you use your phone, look no further. We can think of a few ideas that would make this case the perfect accessory for some really cool Halloween costumes.